Everything about "Kung Fu Panda" is a little better, a little sharper, a little funnier than the animated run of the mill. It's one of the few comedies of 2008 in any style or genre that knows what it's doing. Plus, all its jokes actually belong to the same movie, which is set in ancient China by way of Jack Black. In other words, it may have Black fulminating about "(going) blind from overexposure to pure awesomeness!" but nobody slips in a Travis Bickle impersonation or utters some pop-culturally exhausted catch phrase such as "Make my day" simply to amuse the parents. 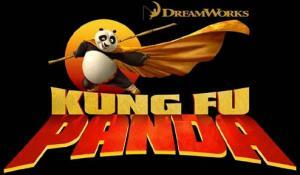 With Jack Black voicing the role of a martial arts-obsessed Kung Fu Panda who lives his dreams of high-flying glory, the film has an air of assurance and rightness of casting from the get-go. Take, for example, the scene in Kung Fu Panda in which star-struck Po tours the Jade Palace's "sacred hall of warriors." He can't believe his big panda eyes. "Master Flying Wino's armor -- with authentic battle damage! The sword of heroes, said to be so sharp you can cut yourself just by looking at -- ow!" You read those exclamations, riffing on Jackie Chan's early "Drunken Master" success a generation ago, and knowing Black's the one doing the voice, you can hear almost precisely how it sounds on-screen, coming from a gob-smacked panda's mouth. And it sounds right. Even with a surfeit of battle sequences riffing on live-action martial arts iconography dating back to "Enter the Dragon," the energy of Kung Fu Panda captivates. "Kung Fu Panda" works from a time- and profit-honed DreamWorks template, the one showcasing the wisenheimer critters of various species. This time, though, even with a surfeit of battle sequences riffing on live-action martial arts iconography dating back to "Enter the Dragon," the energy captivates. All the actors earn their keep, from Angelina Jolie, playing it earnestly and well as a fearsome tigress, to veteran character actor James Hong as Po's dad. He is a goose named Mr. Ping who runs a noodle shop. "We are noodle folk," he tells his apparently adopted son, who would rather not inherit the family business. The goosey way Hong says it brings a smile to your face. The plot of the animated feature Kung Fu Panda, like the quality of the computer animation, is at once familiar and well-executed. Po is ancient China's most ardent fan of his kung fu heroes, the "Furious Five." One day Po sneaks away from his noodle duties to witness the ceremony announcing the selection of the "Dragon Warrior," protector of the Valley of Peace. After accidentally inserting himself into the selection process, Po becomes the chosen one. He must overcome his physical bulk and general geekiness to prove himself to martial arts master Shifu (a gremlin-like rodent voiced, wittily, in a perpetual mutter, by Dustin Hoffman). He must then help save the kingdom from the wrath of a vengeful snow leopard (Ian McShane of "Deadwood"). Directors John Stevenson and Mark Osborne exploit the various training and battle sequences -- one or two too many, probably -- for all they're worth. "Kung Fu Panda" references everything from Bruce Lee to Stephen Chow to Jackie Chan. (Chan voices one of the Furious Five.). The CinemaScope format allows for a lot of spacious lateral flying kicks and background detail in terms of architecture and topography, two things that won't matter in the least to the film's target audience, unless they're sons and daughters of landscape architects. But the execution is elegant, even at its most slapstick. I particularly like Po and Shifu's battle for control of a dumpling, waged with chopsticks. Many won't agree with this next statement, particularly if they're fans of the monstrously lucrative "Shrek" franchise. But here it is: I prefer "Kung Fu Panda" to any of the "Shreks," along with moderately diverting entertainments such as "Bee Movie," plus more grating items such as "Madagascar," "Shark Tale" and "Over the Hedge." We're still a good distance here from a modern classic, such as last summer's "Ratatouille," a work of true and idiosyncratic artistry about a true and idiosyncratic artist. The main virtue of "Kung Fu Panda" (doesn't that title just smell like money being minted?) is its skill in freshening up the old formulas, with a prime voice cast and a verifiable sense of humor. The story comes from a less cynical place than most other animated features. And by the time the end credits roll, the soundtrack's use of "Kung Fu Fighting" seems like a happy inevitability, like so much else in this exuberant studio product. PG (sequences of martial arts action). 1:35. Enthusiastic, big and a little clumsy, Po is the biggest fan of Kung Fu around ... which doesn't exactly come in handy while working every day in his family's noodle shop. Unexpectedly chosen to fulfill an ancient prophecy and train in the art of Kung Fu, giant panda Po (Jack Black) begins his study under Master Shifu (below, DUSTIN HOFFMAN), the trainer of the legendary Furious Five, in DreamWorks Animation’s "Kung Fu Panda," which will be distributed by Paramount Pictures in June 2008. DreamWorks Animation SKG Presents "Kung Fu Panda," a Paramount Pictures release featuring the voices of Jack Black, Dustin Hoffman, Angelina Jolie, Jackie Chan, Lucy Liu, Ian McShane, David Cross, Seth Rogen, Michael Clarke Duncan, James Hong, Randall Duk Kim and Dan Fogler. The film is directed by John Stevenson and Mark Osborne. The producer is Melissa Cobb. The co-producers are Jonathan Aibel and Glenn Berger.